I love this set of minimalist Disney posters from re:blog! They’ve been a great tool to explore critical thinking and metacognition. 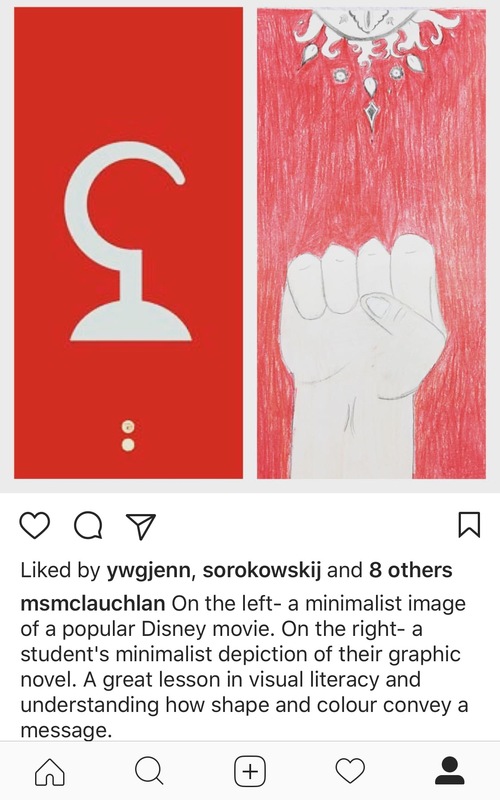 I post the images around the room in a gallery walk style (with the movie title cropped off of the top) and ask students to circulate around the room. While they visit each poster, they fill in a t-chart with two columns: Which movie is represented? and (more importantly) How do you know? If students are unable to recognize the movie, I ask them to just fill in the “How do you know?” column with important visual details. Yellow noodle uniting the two in a kiss, connecting to other story archetypes of similar “romantic unity” theme: The Outsiders, Twilight, Romeo and Juliet. After we’ve decoded all of the posters, I provide students with white paper and drawing supplies and tell them to create their own minimalist drawing of a story (can be book, movie, video game, comic) I also remind students to apply what we’ve learned about color theory, symbolism, purposeful placement and other visual techniques we’ve seen artists use to convey a larger message. I try to encourage students to keep their design a secret so that we can do a “show and guess” with the rest of class. While students are designing, I circulate around the room and interview students about their minimalist drawing, prompting and asking questions of their designs. This can be helpful to extend the thinking of students that create designs that are too minimalist, or the opposite, students that are finding it difficult to simplify their design. What I like most about this activity is that at various points it encourages students to think aloud, and share their metacognitive processes. As such, it provides a teacher with various points of observation and conversation to assess a student’s critical thinking and metacognition.